Innovation from Austria: Love to cook? 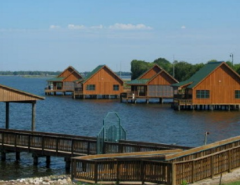 Not looking to eat peanut butter and protein bars after a hike or boating? Enjoy a great cooked meal at your leisure at an outside location for your view while you cook and dine. Cook in the great outdoors with the utmost sophistication – with Camp Champ, your portable kitchen.Camp Champ provides complete kitchen equipment for six people, without getting anyone’s blood boiling. Equipment includes a gas cooker with high-performance burners, four ready-to-go cooking surfaces, generous working space and plenty of room for pots, pans, and all your cooking utensils – all at a size of just 660 x 540 x 570 mm when closed. 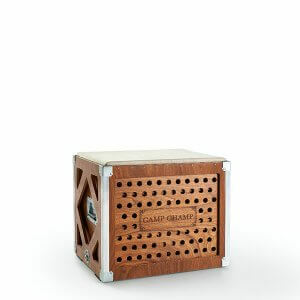 One tiny box is taking glamping (that’s glamorous camping for all you true outdoorsmen and women) to a whole new level. 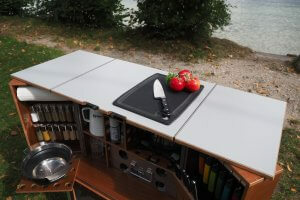 If you’ve ever lamented your inability to take your entire kitchen with you on trips to Mother Nature, fret no longer — the Camp Champ is here to save the day. 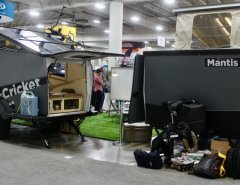 Clearly not intended for the Appalachian Trail hiker who has resigned him or herself to living on beef jerky and peanut butter, the literal kitchen in a box is meant for the gourmand who wants a Michelin-worthy meal in the great outdoors. 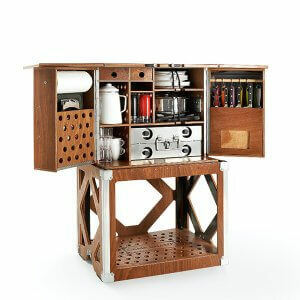 The box opens up to reveal a fully stocked spice rack to a full set of knives, a coffee maker, and a corkscrew (because you can’t go into the woods and not have wine). And of course, there’s a stove and plenty of counter space too. So go ahead, pack up your kitchen and head off to the mountains. 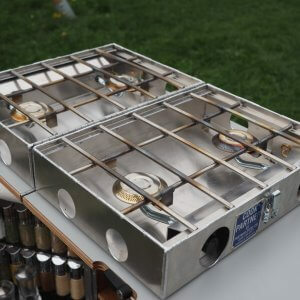 Equipment includes cushions to sit on, a double-burner grill with a griddle pan, a whetstone (for all the knives in the full knife block), a stainless steel sieve, dessert plates, and a grater, just to name a few. When closed, the box is 680 x 540 x 570 mm (26 x 21 x 22 inches), and when open, it goes to 50 x 22 x 43 inches in dimension. Of course, it’s not exactly something you’d want to lug over the Swiss Alps, as the fully stocked kitchen weighs in at an alarming 154 pounds. 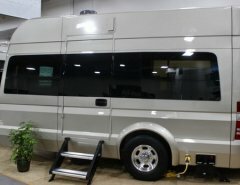 It’ll also cost you a pretty penny (and is very pretty itself too), setting the avid diner/camper back a solid $6,120. But hey, the heart wants what the heart wants. And sometimes, it’s a gourmet meal in the mountains. 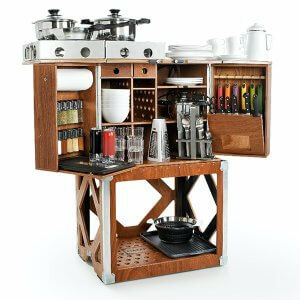 Made from a tiny kitchen.